Selection Sunday booyyyyssss, and I am hyped beyond belief because ever since I started regularly watching the tournament about 4-5 years ago, it's gotten better every year for me and these days I look forward to March Madness as much as I do the latter stages of the CL or every league except Serie A. Started a new thread instead of bumping the old one because I don't think my heart can take revisiting that old thread again with multiple years of heartbreak including my enraged thoughts post Wisconsin loss in the championship two years ago. Who here in GL is going to be watching the tournament? For those who are, who are you pulling for? I'll update the post later today after the bracket is released. Personally have pretty low expectations for Wisconsin this year, we're far too inconsistent with not enough upside to make a deep run I think. Just gonna focus on enjoying the tournament as much as possible. Personally think Roadhog Street warriors are favourite to win Madness event. 3 favorites are the Mass Effect Andromedas, The Zero Dawns (rich mans Phoenix Suns) and Breath of The Wild. But those teams are gonna cause a madness tho. March Madnessis one of the most hype tournaments in sports. Serious question, which sport is it? Hockey??? Is this where Patrick lane plays who harmonica hypes??? @RealGunner wrote: Serious question, which sport is it? Hockey??? Agreed with CB, you lads are missing out big time. 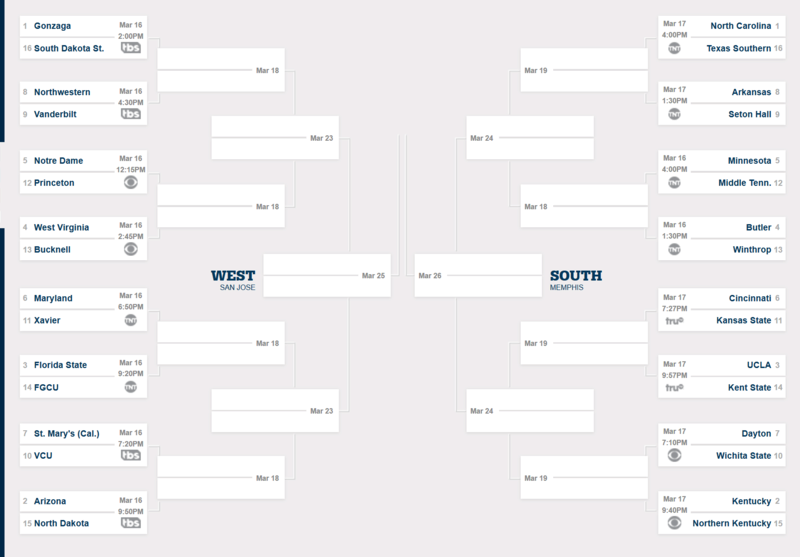 Bracket here, I'll post pics later when I get a pic I can send in full as opposed to several of them. Or I'll just do several of them. Going to see John Mulaney later on in the night too, will have to miss the Wisconsin game. Apparently everyone hates Duke. So I have found my team to cheer for other than Lonzo Ball. I mean you didn't know that Freeza lol? Puke have been hated since the beginning of Basketball time ffs. @Great Leader Sprucenuce wrote: I mean you didn't know that Freeza lol? Only thing that could make Dmize return tbh. Pretty fun so far. Fun to see so many impure shooting motions compared to NBA where you only get a Shawn Marion or Noah once a decade. I'm surprised it still happens, i felt Steph would start influencing shooters even at the college level. Maybe we are still a few years from that. @Great Leader Sprucenuce wrote: LMAO. Steph will result in wack as motions like Lonzo Ball's. It's soooo broken. No idea how he shoots 42% from the 3. He learned to shoot by shooting 30 footers, so his motion looks like when a grown man has to get enough power to pull off a full court shot. I don't think he can get it off in the NBA. His playstyle though. Seems amazing. No dog in this fight this year. I don't expect MSU to get far unfortunately. Will watch UM with casual amusement though. With the way this team has been playing until March I had no expectations. Won the first game but it was sketch, then to beat the reigning champions and overall #1 seed while being completely f**ked by the refs the entire game. It's incredible. Bronson with the clutch factor, hayes with the winner, did it while playing Wisconsin basketball. Incredible game, best of the tournament so far (which has been pretty average). What an upset (although Wisconsin is more like a 5 or 6 seed). Which is again, and I think I made this point, ridiculous. What is the committee doing giving teams like Wisconsin an 8 seed? 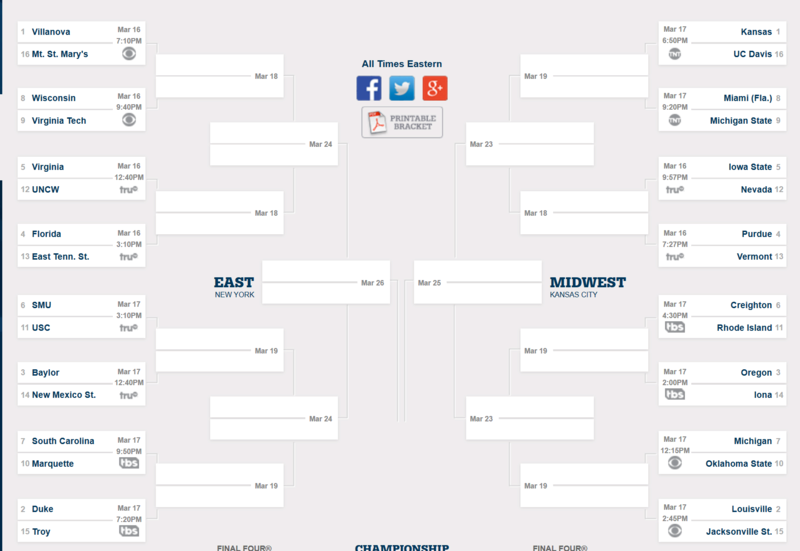 There is no need to have either Wisconsin or Villanova going out during the second round. Great game, fun to watch, but teams of that quality should be facing off in the sweet sixteen or later. Congrats McLewis on winning the first game. I really dislike Michigan State (respect Izzo though), but I might be able to root for you guys...maybe. Young team though, I didn't expect you guys to even win the first round.